The craft show we went to was great to get the creativity juices flowing, but I haven't really had time to do anything about it, yet. Soon. The house is semi-clean, it's rainy and gloomy outside, and we do have company here at the moment, and more coming throughout the week, but I should still have my days alone, so maybe I'll get something done! I got a few things at the show that I'm excited to play with, thousands of pictures and a few projects that I really need to get on. This week, will be crafty!! I took one photo at the show of a quilt for my mom, and then I looked down the wall, and it was one of a thousand amazing quilts, so I put my camera away and just looked. It's a little green looking thanks to the fluorescent lights, but it was very intricate. 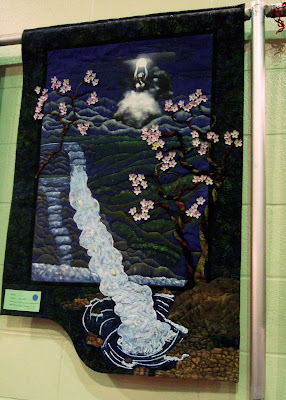 The trees were made of two colours of material twisted into a trunk and branches and the blossoms and water were 3-D.... very impressive, especially coming from a non-quilter.